Its Cricket Season, and I don’t mean the game. With all the rain and heat, those little buggers have hatched into the millions. When walking down the street you need watch for the cars, the crickets jumping on your clothes, and birds diving down looking for a snack. When opening and closing doors, you need to check and make sure some little noisy bug is not following you in. 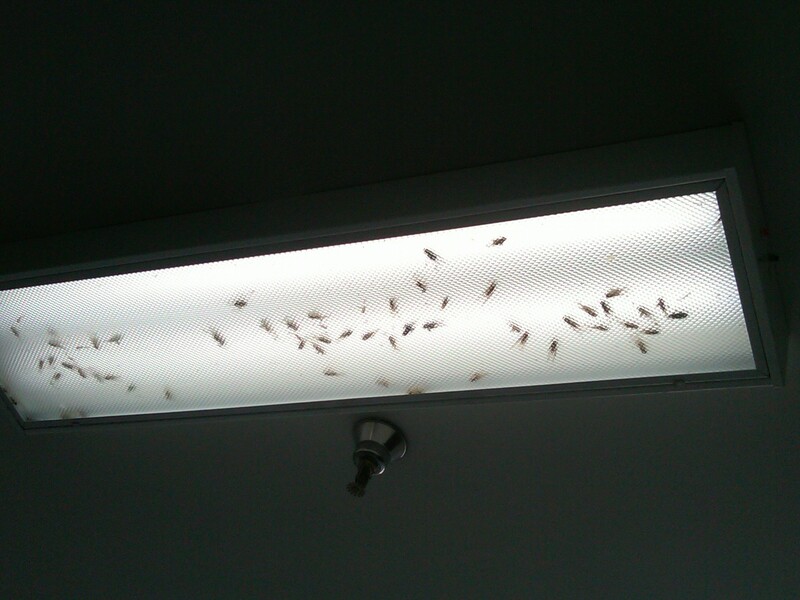 Some places have hundreds of the bugs crawling around when the door is opened, as happened to a local shopping center. The sides of homes and buildings will soon be plastered in a black moving mass as these noisy little bugs try getting in. Streets and sidewalks will be pasted with flattened bodies. Totally gross. And the noise! They say it will last about 30 days or so. The next 4.5 weeks will be long. This is a picture of one of the overhead lights when you get off the elevator. Already filled with crickets. I hate going under this thing. I really don’t like crickets. This entry was posted in Opinions and tagged cricket season, San Antonio. Bookmark the permalink.